Ahead of the IsraWinExpo 2012, which takes place between 21 and 23 February, the Wine & Gourmet magazine collected a number of wines from wineries around Israel showing at the exhibition, and indulged in a spot of wine tasting. 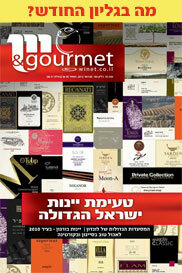 The tasting panel included, among others, Yair Haido, Uri Gilboa, Dr. Arkady Papikian, Itai Lahat, and Yotam Sharon. The Ramot Naftaly Winery sent in three wines for the tasting, two of which were among those considered “Outstanding” by the panel.